I want to start off my recap for episode 16 of Bride of the Century by giving a heartfelt thanks to the cast, crew, and production team behind this drama. It’s not easy gaining viewership or traction when a drama airs on cable, even harder when it’s one of the most niche and small cable networks such as Chosen TV. Right off the bat Bride of the Century was off-putting with its silly name and a cast of no known audience lures outside of F.T. Island and/or Lee Hong Ki fangirls. If anyone claims to be a Yang Jin Sung fan and that was the reason for checking out this drama, then you’re likely the first and only. Becoming a drama veteran means losing the element of surprise these days, I write about castings and previews and always have an ear to the ground so rarely does a drama sneak up on me. So the chance encounter with BotC felt like a double dose of pleasure to be surprised about a drama I never noticed and have it end up being so delightfully entertaining a watch. Perhaps it ought to be a triple dose of pleasure since I also acquired two new acting loves in Lee Hong Ki and Yang Jin Sung. The pleasure I derived from this drama, it all came from a place of zero expectation so I can’t say future viewers who watch BotC after hearing raves and recommendations will necessarily like it as much. I do think a lot about it will stand up to the test of time. BotC was a throwback K-drama that used plenty of tropes but in ways that worked. I can’t tell you how hard that is since some dramas end up sinking on just one trope done wrong. While the drama did have a stronger start than finish, it didn’t putter to a conclusion and actually allowed the final two episodes to say something meaningful and heartfelt about what the central premise of this story was all about. All the mysteries were revealed by the end without any threads left hanging which was also quite a feat. Admittedly some of the heady romance mellowed into loving companionship but I think this drama’s nicely plotted and paced trajectory still delivered on what it set out to do. I watched a fantastic OTP fall in love and overcome all odds to be together and did so in a way that left a positive impression on the world around them. That’s a pretty nifty thing to pull off these days and for that I’m pleased as a peach with BotC when all is said and done. Byul tells Doo Rim to endure this painful journey now so that once she walks the path she will be able to see what awaits her at the end of the road. Doo Rim stares at Byul and then the two of them look out over the water together. Kang Joo sports a different hairstyle and is walking the department store floor with Roo Mi and Secretary Kim. Roo Mi mentions that the department store won the highest honor in Korea this year which is a good image booster for the company. Kang Joo’s plan to convert part-timers to full-time employees has also garnered good public feedback. Roo Mi knows what is behind Kang Joo’s change and that brings a smirk to Kang Joo’s face. 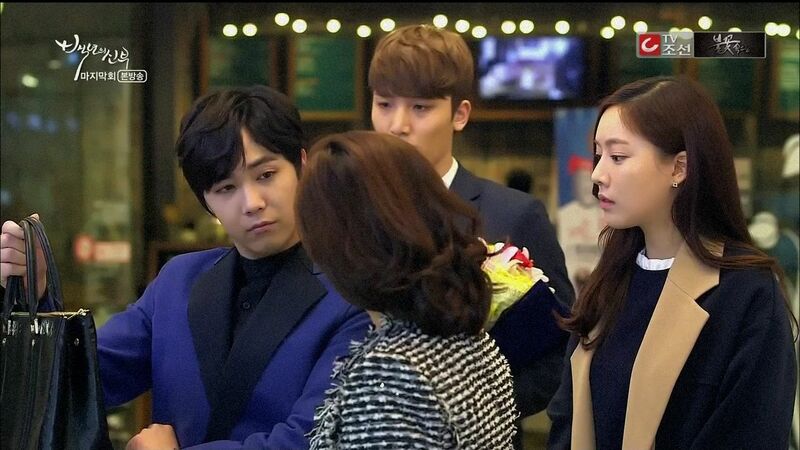 Kang Joo stops when he sees a VVIP customer being difficult with a sales clerk insisting on returning a purse past the return period. The sales clerk remains polite but stands her ground so the customer angrily tosses the purse at her. 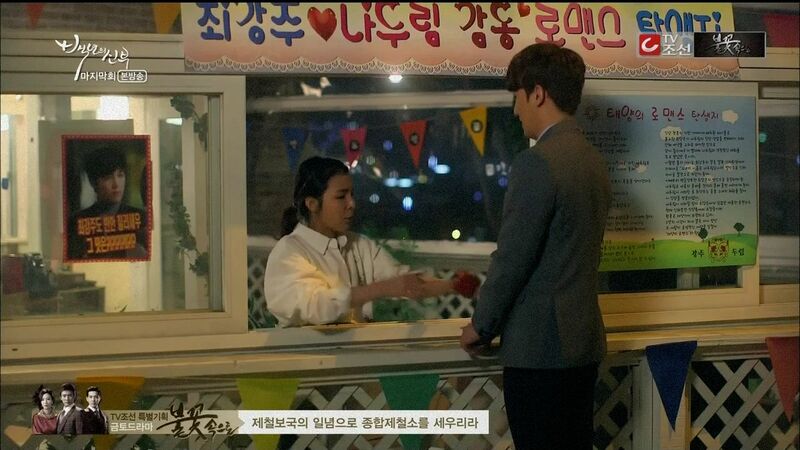 Kang Joo walks over and calls the customer “ahjumma” and says she doesn’t match up to the purse anyway so he orders the sales clerk to process the return. But in turn the customer has to apologize to the sales clerk. The customer storms off and Kang Joo tells Roo Mi to go handle it. Kang Joo runs into the department store endorsement model who is clearly interested in him and asks to have dinner when he has time. She whispers in his ear wondering why he’s not married? Kang Joo whips out his left hand with the wedding ring on it and informs her that he is already married. He walks off leaving the model wondering if she got rejected for that Na Doo Rim or some ghost bride. Kang Joo finds a toddler crying in the play area and picks him up. He suddenly sees Doo Rim walking towards him but it’s just a figment of his imagination as the toddler’s mother comes to take him back. Kang Joo’s dad visits his dead first wife’s memorial spot with Kang Joo’s mom. He mentions that it’s been two years since she left home but he’s been waiting for her daily since. In the days ahead he wants to live as her man. He understands know that it was fate which brought her to him. When he dies he will go back to the earth but if he becomes the wind then he hopes the first person he meets is her. Kang Joo’s mom asks “What if I say no?” Kang Joo’s dad smiles and embraces her and she smiles and hugs him back. Well that was easy. 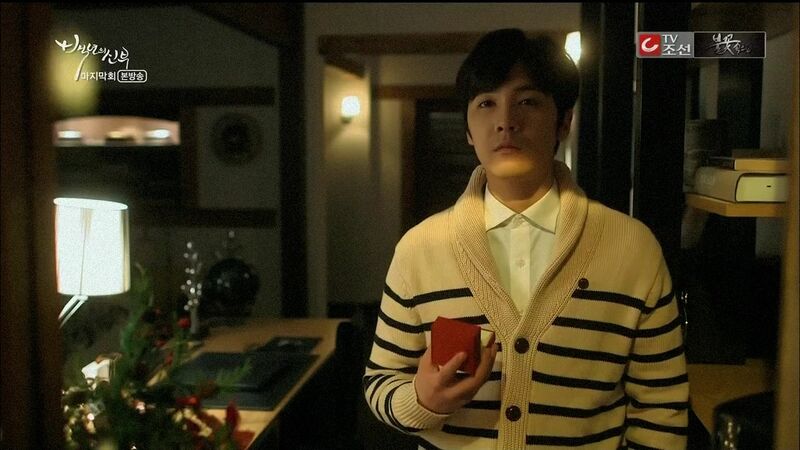 Kang Joo stands in his room and stares at the wedding ring and thinks “It’s been two years since that woman left. As she wanted, a peaceful world has been created. Those who have left have now returned.” Kang In comes in to call Kang Joo out to have a snack. The Choi family sits down to a roasted sweet potato with kimchee late night snack. Kang In discusses his upcoming showcase and asks his mom why this particular dish for a snack? It makes him miss Doo Rim noona and he wishes she could come to his next showcase. Kang Joo hands a peeled sweet potato to his mom which gets everyone to want one as well. Another Spring arrives and Doo Rim heads to work but not before kissing her son Kang Rim goodbye. Awwww, his name! Halmoni hands Doo Rim her lunch and then waves her off. Doo Rim heads to the pier to run her daily fresh fish stand at the outdoor market. A high school girl walks by and tells Doo Rim that she got number one on her exams. That makes Doo Rim happy and she hands some food and medicine for the girl to take back to her grandfather and then gives her a bit of pocket money for doing well in school. The girl promises to keep doing well in school. Kang Joo’s dad finds Kang Joo kneeling by the momma cat grave and mentions how the Spring has made the flowers bloom and is also when the birds come back to nest. With his waiting and patience good news will come soon. Kang In and Roo Mi go to see the fortune teller who thinks they are here for marital fortune but Roo Mi cuts him off and explains she is here to look for a Na Doo Rim. The fortune teller snarks that they ought to go to the police or a detective agency to find someone since he has no power to find people. Roo Mi doesn’t know why this fortune teller can’t help. The fortune teller says Kang In and Roo Mi are a match made in Heaven and fated to be. That makes Kang In smile but Roo Mi says that won’t happen. The fortune teller says if they don’t get married then misfortune will befall both. He tells Roo Mi to not be blind to the precious gem before her otherwise she is ruining her own future. Roo Mi still doesn’t believe him and heads out. After she leaves, Kang In winks at him and says “thank you” before handing him an envelope. He takes it out and wonders why he has no spiritual eye lately and needs to take money from the youngsters to tell them what they want to hear. Heh. Roo Mi hands the latest Doo Rim sighting location to Kang Joo and he heads there like he always does even if he comes home empty handed. After he walks out, Roo Mi prays to the Heavens to let them finally find each other. Kang Joo arrives at the port town where Doo Rim now lives and he walks around showing her picture to people while we see Doo Rim doing her daily deliveries around town. They end up just barely missing each other a few times. Kang Joo is about to give up when night falls and he gets a call from Roo Mi about a new lead elsewhere. As he’s walking away, Doo Rim is nearby and someone bumps into her which makes her drop her bag. A ball of red yard rolls down the hill and stops next to Kang Joo’s feet. He picks it up and looks back to see Doo Rim standing there staring at him. FINALLY. They stare at and slowly walk towards each other. This moment might call for some slo-mo running towards each other motion but I’ll take what I can get. Doo Rim starts to cry while Kang Joo smiles with his eyes filled with tears. He has to look down for a second to compose himself. Kang Joo heads to where Doo Rim lives with halmoni and baby Kang Rim. We see a Kang Joo dedicated wall covered with news articles about him, which isn’t stalkerish at all in this context. Doo Rim tells baby Kang Rim that his daddy is here. Daddy Kang Joo has truly learned major patience over the years because he doesn’t flip his lid and instead smiles at the baby warmly. He hears that the baby is named after both Kang Joo and Doo Rim but all his features look like Kang Joo. Halmoni is so grateful that Kang Joo didn’t forget Doo Rim and came to find her. Kang Joo asks halmoni to accept a full bow from him, which is the greatest respect he can pay her as Doo Rim’s elder. He apologizes for coming so late, he is so sorry. Kang Rim starts saying “appa, appa”. AWWWWW. Jin Joo is now running the restaurant and customers come now because this restaurant is now known as where Choi Kang Joo and Na Doo Rim’s love story began. They have read their love story and it made them cry. They want to know where Doo Rim is now so they can get her signature but Jin Joo says Doo Rim is visiting her in-laws. Halmoni sits down with the entire Choi family and unwraps one red bridal shoe. Kang Joo’s parents both recognize it. Flashback to fifty years ago when Doo Rim’s grandmother was marrying Kang Joo’s grandfather. During their wedding night, she purposely drugged the drink. 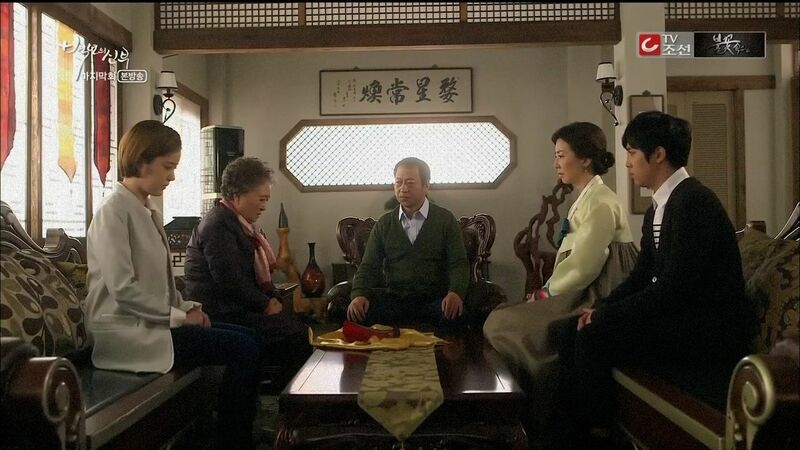 Kang Joo’s grandfather sits down and asks if she believes in the curse that the first bride of the family will die as an offering to the family protector ghost. Doo Rim’s grandmother says nothing. Kang Joo’s grandfather gets up to sit next to her and takes her hand. He reveals that he actually purposely spread the curse because it was the only way he could marry her. The first time he met her was that Spring when she came to sew for the family. He saw her smile as she was complimented for her skills. He fell in love with her at first sight. Kang Joo’s grandfather wanted to marry her but his family wouldn’t allow it. So he spread the rumor so that his engagement was broken and other well-to-do families wouldn’t marry their daughters to him. He ended up being allowed to buy a bride and he got to marry the poor Doo Rim’s grandmother. He asks her not to be scared now because she won’t die because of some curse he made up. 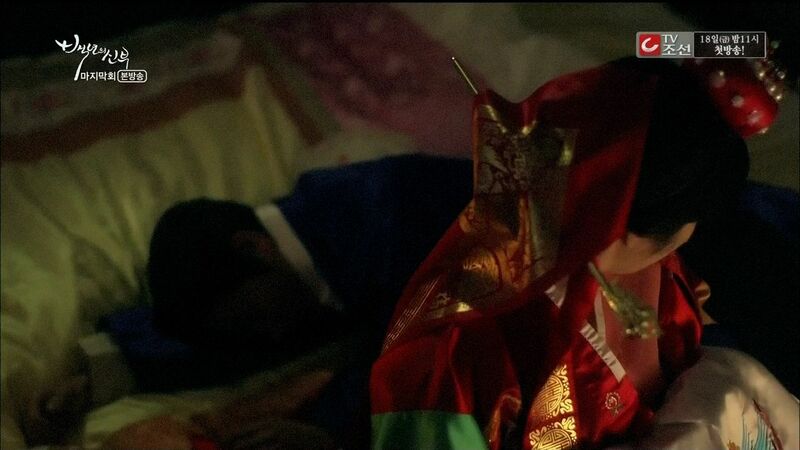 As Kang Joo’s grandfather moves to consummate the marriage, he suddenly feels faint and collapses. Doo Rim’s grandmother runs out of the room and the next scene is her running away with another man. As they run along the cliff, she stops to take off one of her bridal shoes to leave behind making it appear that she fell off the cliff chased by the family ghost. Her lover piggybacks her the rest of the way. Kang Joo’s grandfather is told that they can’t find the body. He also asked for another investigation and is told that another man who lived in the same village also disappeared last night and he was formerly sweethearts with Doo Rim’s grandmother. Kang Joo’s grandfather realizes that Doo Rim’s grandmother left him intentionally for another man. He’s so angry but because he loves her then he will let her go. He ends up taking her one left behind shoe back to the family altar and leaves it there. Doo Rim’s grandmother apologizes to the Choi family for what she did but Kang Joo’s father is not angry. It’s hard to find the right marital destiny and even if she wasn’t meant to be with Kang Joo’s grandfother, now Kang Joo is destined to be with Doo Rim. Halmoni accepts the forgiveness and everyone smiles. The two bridal shoes are reunited and Doo Rim and Kang Joo stand before the family altar. He promises to protect his bride and then takes Doo Rim’s hand. They embrace before the altar which is now a place not of fear but of love. 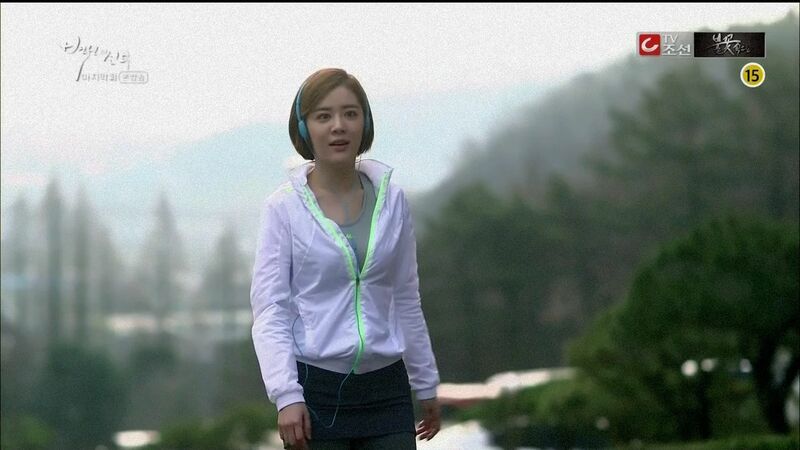 Yi Kyung is jogging towards the mental hospital where her mom now lives when she stops and smiles. Standing there is Doo Rim and the two lookalikes smile at each other warmly. Yi Kyung tells her mom that the guest they have been waiting for a long time is finally here. President Ma has no reaction to that. Yi Kyung moves to the side and allows Doo Rim to sit down next to President Ma. Doo Rim takes President Ma’s hand and tells her that Doo Rim is here. President Ma looks at her with tears in her eyes. She smiles and Doo Rim asks if she recognizes her? President Ma says “Doo Rim-ah” and asks why she’s here now since she’s been waiting for so long. President Ma apologizes to Doo Rim and asks if she can forgive her? Doo Rim smiles and nods her head while Yi Kyung cries. President Ma embraces Doo Rim. Doo Rim puts a new tie on Kang Joo’s dad and says it’s very suitable for him which is why she picked it out with Kang Joo. He poses for her and she compliments him on looking like the perfect gentleman. Kang Joo’s mom walks out all dressed for the night out. She says they look so lovely together. Kang Joo’s mom tells Doo Rim not to expect them home tonight since they are going to stay in the villa after the party. They leave all happy. Doo Rim goes to pampered with Yi Hyun accompanying her. He’s happy to treat her since the company is doing well with him at the helm and he’s the one who is grateful for all Doo Rim has done. Jin Joo is closing up the restaurant with Secretary Kim comes by and awkwardly asks to speak with her. Secretary Kim stammers until he whips out an engagement ring. He confesses it’s been in his pocket for the last month. Jin Joo shoves it back in his hands and tells him to put it on her right away. He puts it on and she screams in happiness before kissing him. Secretary Kim had a great proposal planned but Jin Joo thinks he’s already done well. They happily hug. Doo Rim is cooking with the housekeeper as today is worship day so she wants to help prepare the food as well. Kang Joo is holding Kang Rim and peeking in. Kang In comes by to marvel at how much Kang Joo has changed to a man carrying a baby around all day. He notes that Kang Rim will grow up to be a ladykiller but Kang Joo says his son will be an one-woman man like he is. Kang In asks who they are praying today and Kang Joo chides him for not knowing that it’s the memorial day for their great-grandfather. Doo Rim says they need to also pray to another person who is keeping the family line safe. The entire family gathers to pray to the ancestors as well as to Byul. 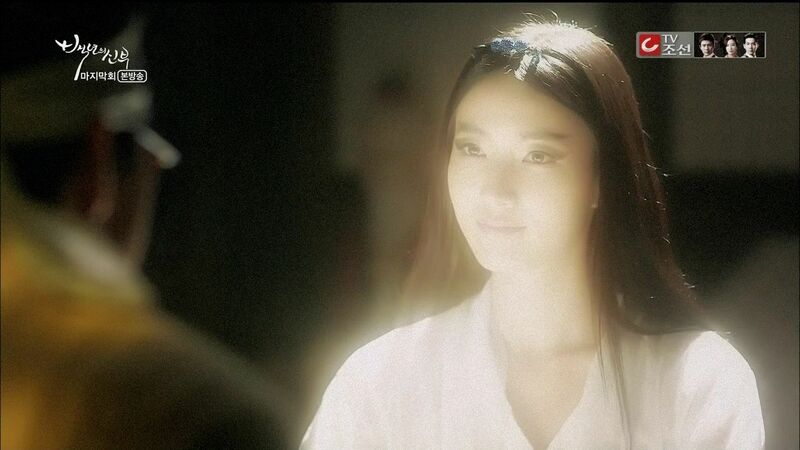 We see that Byul and her beloved young master appear to be together now in the afterlife. Doo Rim and Kang Joo sit outside after a long day of prayer and she feels like so much needed to happen for them to have met. She feels very grateful to those who allowed Kang Joo to be born. Doo Rim wants to continue their unfinished conversation about when Kang Joo started to like her? Kang Joo says it was their first family introduction lunch when she grabbed his tie as she tripped and they kissed. Doo Rim is surprised and brings up the kiss at Kang In’s showcase which Kang Joo explains looked like acting but he was actually sincere. Doo Rim blushes and says her heart is beating faster even now as she looks at him. That’s not surprising for Kang Joo since he’s so charismatic, but then he tells Doo Rim that his heart is also beating faster when he looks at her now. She nestles on his shoulder. The fortune teller is pulling a late night studying booking on divination. Suddenly Byul appears before him and he quickly gets up to welcome her. He notices Byul is smiling and wonders what good thing happened? Byul ate the worship food prepared sincerely for her and it’s so delicious and she’s all full now. The fortune teller dares to ask Byul how the two girls look identical even though they are not related. Byul smiles and we see baby Doo Rim in her mom’s arms while President Ma smiles at her baby Yi Kyung. Suddenly a darkness descends in the room and President Ma faints. Byul appears and waves her hand over baby Yi Kyung’s face and changes it to be identical to baby Doo Rim’s face. Byul says that from now on, the two girls will no longer be one sun and one shadow but will instead both continue on their own lives as two different suns. The fortune teller wonders if Byul is leaving now that her wish has been fulfilled? Byul knows that his business isn’t doing well so he wants her to stay. He asks if she really needs to leave? 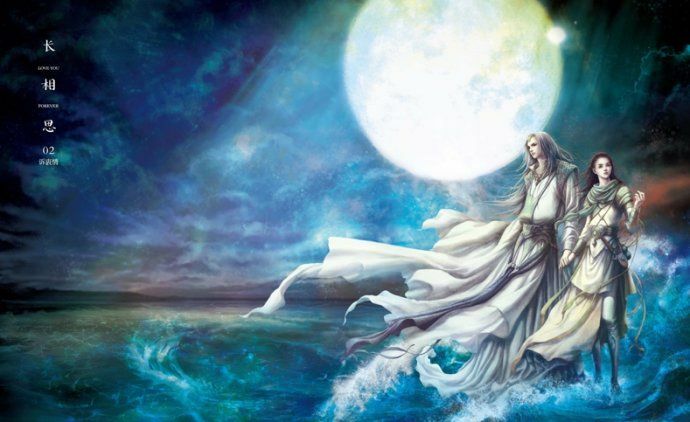 Byul says that parting only allows meeting again and that is an unchangeable truth about life. She disappears and the fortune teller goes back to studying to earn his keep himself. Kang Joo’s mom finds the dining room empty even thought Doo Rim asked to learn tea from her and looks towards Kang Joo’s dad’s study. Everyone is inside playing hwatu with Doo Rim winning over everyone else. She walks in and Doo Rim immediately apologizes and sticks the blame on Kang Joo for this game. Kang Joo doesn’t help out his wife and says it was all Doo Rim’s idea. Kang Joo’s mom notices her husband is losing and tells Doo Rim to pass the cards out. She warns Doo Rim not to cry when she loses. She then chides Kang Joo’s dad for losing to the kids. Heh. Doo Rim offers up a cup of tea she brewed to Kang Joo’s mom who takes a sip and compliments her on doing well. Doo Rim asks if the butler and the housekeeper can have some time off so they can visit their married daughter who lives far away. Kang Joo’s mom likes the idea and tells Doo Rim to go ahead. She then hands the side residence key to Doo Rim and asks her to handle it going forward. She can see Doo Rim taking care of the family and even the help and she knows Doo Rim will lead the family well. The housekeeper rushes over because Kang Rim is missing and appears to have wandered off in the blink of an eye. Doo Rim knows he’s in the side residence. The ladies laugh that he’s just like Kang Joo that way. We see Byul dandling little Kang Rim happily. Doo Rim and Kang Joo walk through the courtyard and he suggests planning a new tree to name after Kang Rim so that it can grow up tall and strong as well. Doo Rim tells Kang Joo that it’s not easy to plant a tree and to ask for help. Kang Joo refuses and wants to do it himself since it’s a tree for his Kang Rim. Kang Joo looks around the courtyard to find the right spot for the new tree. Doo Rim points out that all the flowers are blooming on the existing trees and they walk off arm-in-arm. I thought the writer of BotC did a really good job telling an unique story. The writing stuck to the confines of the mythology of the curse, the ghost, and the idea of reincarnation with good being rewarded and evil being punished. Most importantly it adhered to the mantra that love is the key to break the chain of anger and used that platform consistently to the end. I quite liked it even if the final major plot point was the much-disliked OTP separation sequence. It worked here for various reasons, but that’s not to say it didn’t still have the same effect of sucking some of the romance out of the air. The separation wasn’t milked for tears and really did solve all the lingering knots left in the story. It did so by using time to mellow out the public disdain for Kang Joo and Doo Rim’s romance, it did so by making Kang Joo’s dad realize that he’s always loved Kang Joo’s mom but took her for granted by carrying around his first love, and it taught Kang Joo the final lesson he needed to learn which was humility chiseled by patience. It was also the period of penance for President Ma, whether gaining Doo Rim’s forgiveness means she was going to recover from her mental illness or not, she still spent two years trapped in that hospital bed going crazy. Yi Kyung kept her mother company and in that love and devotion she regained her own humanity. The lack of tears, recriminations, and needing to discuss issues in the final episode was a mature way to let the lover’s reconcile after their time apart. Kang Joo was sad but not angry, Doo Rim was resilient but not delusional. He missed her, she missed him, and perhaps their separation wasn’t 100% unavoidable or absolutely necessary but to argue that is beside the point, it’s a choice she made and he respected. I don’t think Kang Joo started looking for her again until after that Spring talk with his dad about bringing her back. I think he respected her choice and let her leave, and only when he saw that everything around him was back to the way things should be did he reach out to her. It was nicely done because the circumstances which propelled Doo Rim to leave had changed over time. Because Korea is a country that has strong Christian and Buddhist beliefs, dramas sometimes incorporates elements and ideology from these two religions into the storytelling. BotC was one of those dramas that was constructed solely out of Buddhist theology and the ending came about using a very Buddhist belief of not forcing things.The water will never be able to pass through the rock in the stream but by parting it can move through. Buddhism has a very central tenet that says a person cannot covet what does not belong and an off-shoot of that says if something is meant to be then sometimes the forceful method is not right and stepping back means preserving a state of harmony for all. It’s definitely a more passive philosophy but I quite appreciated the sensible use of it in this drama. The whole first bride curse and the family ghost was delightfully thought out and followed through on and was definitely one of the highlights of this drama. The supernatural element wasn’t just used for kicks but instead allowed to permeate through the entire story and even gets it own happy ending. Halmoni’s connection with the Choi family was kept secret until the very last episode which worked because it wasn’t all that important anyways. 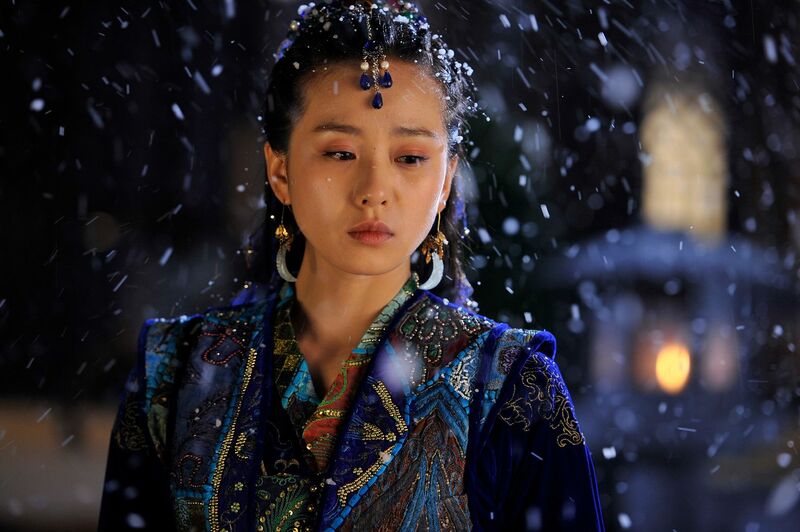 She was one of the first brides but didn’t die because she used the curse to her advantage and ran away with her lover. How cool is that for her to turn her poverty and an unwanted marriage to her own advantage. While Doo Rim and Kang Joo remain a couple for the drama screen only, it was nice to spend time with people who recognize good in others and was capable of change. Doo Rim’s positive influence radiated outward to everyone she touched and in the end it was that kindness which probably brought her the love of her life in the form of the unattainable Kang Joo. They really are a pair one hundred years in the making and it’s been a lovely ride to spend watching them spar and snuggle their way to a happily ever after. This drama was a winner from start-to-finish and for that it’s a keeper in my book. It is here! Been waiting all day for this. Feel like a kid waiting for Christmas. Merry Christmas to me! Thanks Santa koala. Thanks . Now , I am happy. It’s here! I may have been reloading throughout the day, waiting for this. 😉 I so appreciate your recaps throughout this drama’s run. It’s been fantastic fun and now I wait to watch with subs tomorrow night! we’ll missing our doo rim and kang joo. Thank you for such wonderful recaps. Your insights are a great help in understanding the depth of Korean dramas. thank Captain – hehhh, slo mo running & embrace? if this is a big 3 drama, there’ll be a 360 degree kiss as well..
which makes me wonder? there is none between the OTP. 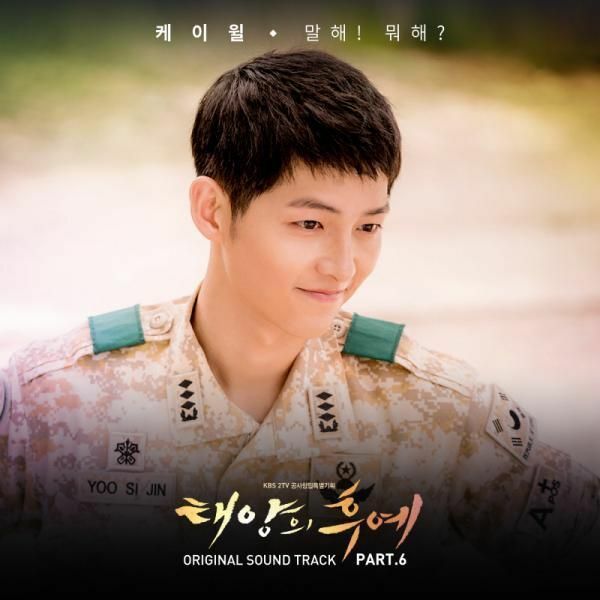 hi, i’m from malaysia..i’m so in love with this drama…. before this, i don’t want to watch this drama at all but now i’m so addicted to it..n i’ve been waiting for the recap since dawn…such a beautiful story.. i appreciate ur time to write the recap of thid drama…thank you!!!! thank you soo much for the recaps.. been waiting to read this..
BOTC has come to an end and i enjoyed each and every episode of this drama.. thank you soo much for introducing me to this drama otherwise i would have missed a masterpiece.. thank you.. Sigh. That’s the end, your recap. I enjoyed this last episode. It was quiet, contemplative and thoughtful. No screeching or screaming but understanding and love. Thank you very much for recapping this drama. Otherwise it would have slipped under my radar. It sounds awful when you read about it and so weird and boring. Instead, it’s turned out to be one of the most enjoyable drama I’ve watched in the last year or so. I didn’t have to scream or rail at the writer. Everything was done just right at the right time. And yes I am also now going to look out for Yang Jin Sung’s next drama. This is a girl to watch for. Yes, everything you said and the *sigh*. I put off watching it until today because I don’t want to leave this pair. Thank you for all your fantastic effort in recapping this drama and sharing your insights. It was a very enjoyable ride! Thank You for your wonderful recaps, this drama will go on my list of all time favorites it never disappointed. I agree with you Koala that this is one of those really good kdrama I have seen in a very long time. 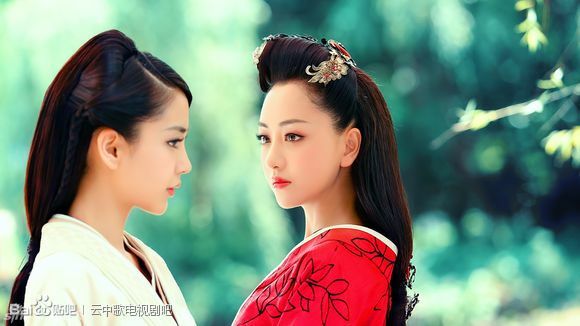 Though I have to agree the last episodes lacks the touchy feeling kissing scenes but all together it was a wonderful drama and I really appreciate the good acting from the main actress Yang Jing Sung. I hope she does more drama because it is very hard to play 2 characters and be so good at it as she was. It is also one of the first kdrama in a long time that concluded everything in 16 episodes and didn’t really leave out a character or plot and not explain the whole situation completely. Good job ChosunTV on choosing this drama and wonderful job to the whole cast and crew. Thanks a bunch Koala for the fast recap as well as for such good insights! I also loved the ending! This drama has taught us viewers a lot of things most central is that you can never get real happiness while causing others unhappiness and pain and that is the reason why I accept the separation between Kang Ju and Doo Rim. Their son Kang Rim is really adorable…the casting director really made a good choice and casted a child that looks like Lee Hong Ki and Yang Jin Sung. As Asians we are really family oriented and seeing a drama like BOTC, where emphasis on relationship and family are highlighted, is a delightful experience. I love it that there was never an exaggerated emotions but everything at the end are mellow and gentle. It’s really realistic! 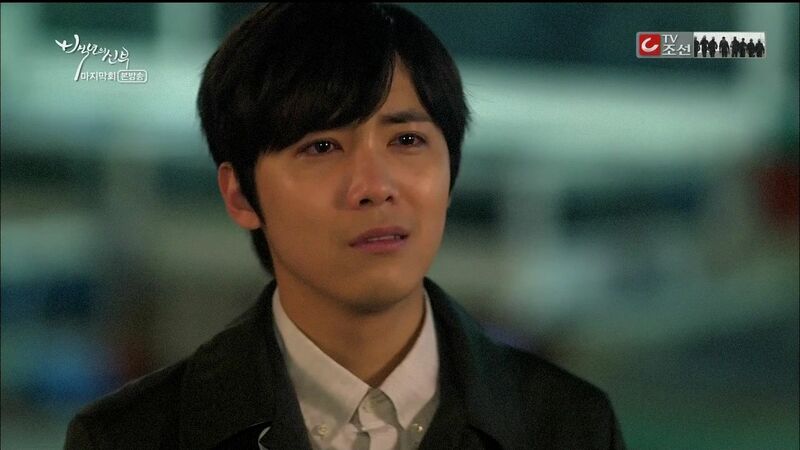 How could I forget, Lee Hong Ki is such an adorable guy and a good actor I love his eyes, they express so many emotions that is what I love the most in an actor, all you have to do is look at his eyes and you know what he is feeling. I want to see him in another drama I love his voice as a singer but he has to act more. Cant thank you enough Ms Koala, this is one drama that I will keep and replay over and over. thaks koala for introduced this drama to me and all your quick recap. reading your thought really enlightened me in term of the philosophy that the writer uses because i did streaming last night even i dont understand korean and feel unsatisfied. well i expecting grand finale with hot kiss and not 2 years separation actually. but i think i can get it now after read this recap why the writer chooses that decision to wrapped up this story. Heh, I was also disappointed with the lack of a kiss. The scene where they talked about how KJ had fallen in love DR just begged for it. Moreover, I hate the long separation trope that drama writers seem to love some much. 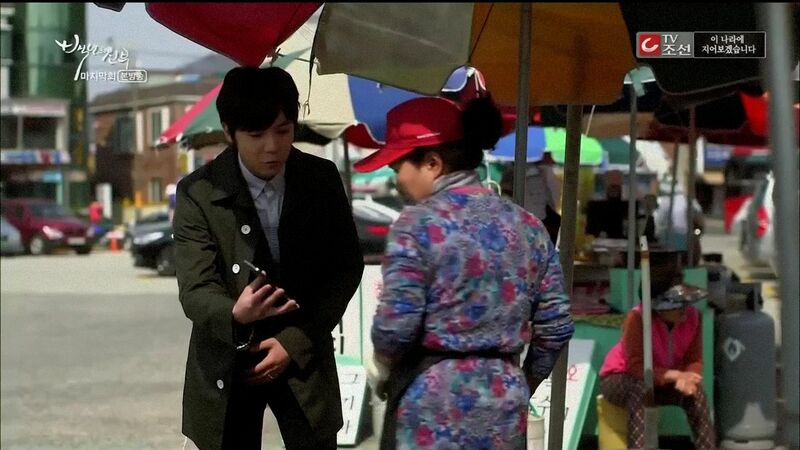 On a brighter side, Hong Ki’s acting was top-notch in this episode, especially during the reunion scene. He has improved so much from the Jeremy times! For the first time in a long long time in dramaland, a writer that knows how to end her drama properly. Thank you writer, staffs and casts. It has been an enjoyable ride from start to finish. Thank you for all the recaps!!! You’re jjang!!!! Thanks Koala for all the re-caps and each and every one of those re-caps were great. BofC is definitely my favorite all time drama. Enjoyed every moment of it from the start to the end. Well done to the writer, all the cast and crew, you all did a wonderful job!! I been waiting for this the whole day..I visited your site today for about 8-10 times waiting for this…hahaha/…I learned to love this drama. Nice plot, good execution of the director and also the performance of the actors. I think it’s one of the few K-dramas that kept me wondering what will happen to the characters until the end. Though Im not a fan of ghost/supernatural stories, I think the ghost in this story made it different from others. And I really love the twist and those unexpected scenes. Well done to the cast and crews. Thanks Koala for the regular recaps of this drama, I think I will keep a copy of this drama In case I want to watch it again. I highly recommend this to everyone. Thanks Koala for all the re-caps, great job and as always you gave your very best. BofC is my all time favorite drama. Enjoyed every single moment of it right from the start to the finish. Kudos to the writer, all the casts and crews. Wonderful job!! I am sure most of us BOTC fans are eternally grateful to Miss Koala for the great recapping and thoughts on the drama. A great help to someone like me who don’t fully understand while watching it raw. I truly enjoyed the show from the start to the end. It’s sad that the show has ended but I’m sure we will always remember with fond memories our Joo-Rim couple and will miss their presence. Kudos to the cast and crew for a fantastic story and the great chemistry between our OTP. Definitely one of the best dramas for me. Wouldn’t it be great if there is a special for BOTC whereby our Doo Rim also wrote a diary documenting her love story and her 2-year separation from KJ. Woohoo! Nice, nice! Thank you so much for recapping this drama! Thx for the lovely recaps, Koala. A question, I don’t get that part which says Roomi understands what’s behind KJ’s change. The obvious answer is DR’s influence. What did he change? Introduced policies of kindness? Love love love this drama! To be honest, when i first heard of the show’s title and plot, i was expecting this to be one of those typical forgettable kdrama that one would watch just to pass time, but oh boy how wrong was i! A lot of the elements of this drama are still typical kdrama stuff (cold chaebol, poor kind-hearted girl, evil mums etc) but somehow it still manages to come across very fresh?? Perhaps it’s due to the casting of mostly unknown (Yang Jin Sung) or unexpected (Lee Hong Ki) actor/actresses; or maybe it’s the writer’s tendency to start off the story using tried and tested formulas so familiar to us but then finishes them off with something we don’t see coming or thought would come only at a later stage. I really love how throughout the show, none of the scenes or subplots are dragged out and everything goes on a pace that is very comfortable and natural. I also love all the characters in this drama, including the antagonists. i may have not agreed or understood some of the decisions the characters made, but i have never hated or disliked any of them. 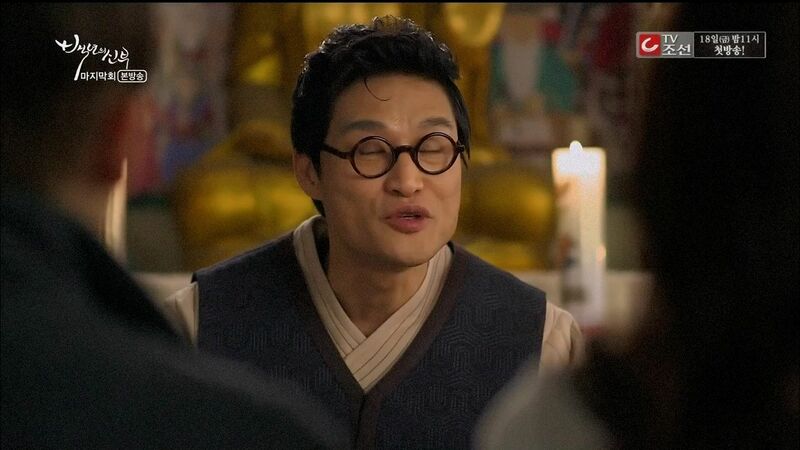 My favourite character out of the lot has got to be Kang Ju. Doo Rim would probably be an easy pick for most due to her kind-hearted and positive nature, but i love the growth we see in Kang Ju. More importantly, i love how his growth is believable and natural (as opposed to a 180 degrees change in personality). I believe we will see more of Yang Jin Sung in the future. She has done well portraying two very different main characters. I won’t say i am a fan of hers yet, reason being i find her crying scenes okay at best to even bad in some (hospital scene when she said she misses Kang Ju). I cry easily when watching drama, and none of her crying scenes moved me to tears, but thankfully i could see her improv on that during the last few episodes. 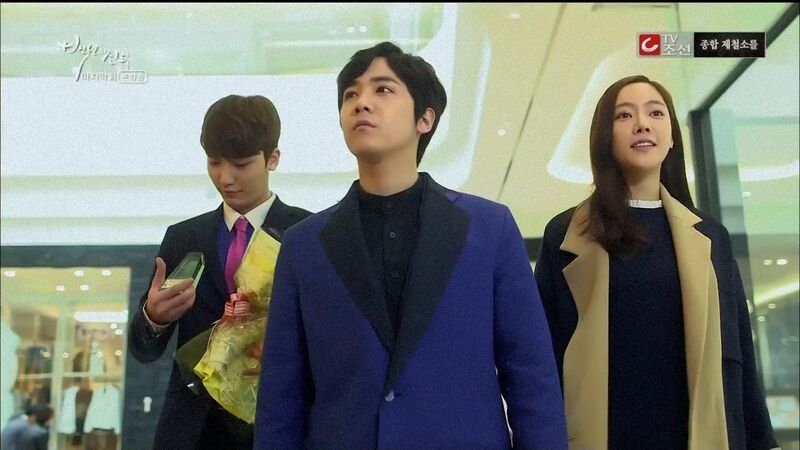 As for Lee Hong Ki, who would have thought he could pull off a role like that? Physically, he had everything working against him for the role(baby face, height), but it was a pleasant surprised to see him played Kang Ju so well. Among idol actors, i would certainly place him among the top. Thanks koala for all the (very quick) recaps. BotC is certainly a gem and i will miss this OTP a lot. No doubt, this will be a drama that i will watch again one day in the future, reliving all of it over again. Kudos to all the cast and crew for a job very well done! Miss Koala, thank you so much for your superb recaps! If it wasn’t for you, I would probably overlook this drama. Thank you for recapping this drama. Would have given this one a miss if not for you. Thank you Koala for introducing this wonderful drama and for recapping this. I really love this last episode and I share your thoughts the final two episodes tells us a lil something how meaningful and heartfelt the story is. The Spring season brings feelings of happiness and cherry blossoms make people smile and make everything cheerier. Kang Ju’s Dad and Doo Rim touched on the arrival of spring and the blooming of flowers and the writer beautifully delivered this happiness in the story and to the viewers. And the writer closes out the happy ending perfectly with Kang Ju and Doo Rim taking a walk through the white cherry blossom courtyard, and Doo Rim teasing Kang Ju he can’t shovel soil when he wants to plant a tree for their Kang Rim, (awww i wanna watch their love story again) too cute! Thanks again Koala! And to the cast, crew and production team, thank you and love you! 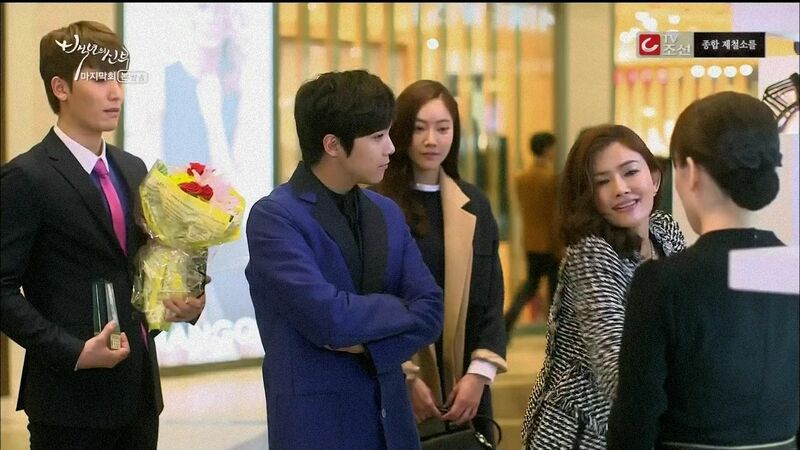 I am a little sad that Bride of the Century has ended. I could do with Bride of the Century 2 to continue the love story of Doo Rim and Kang Joo. 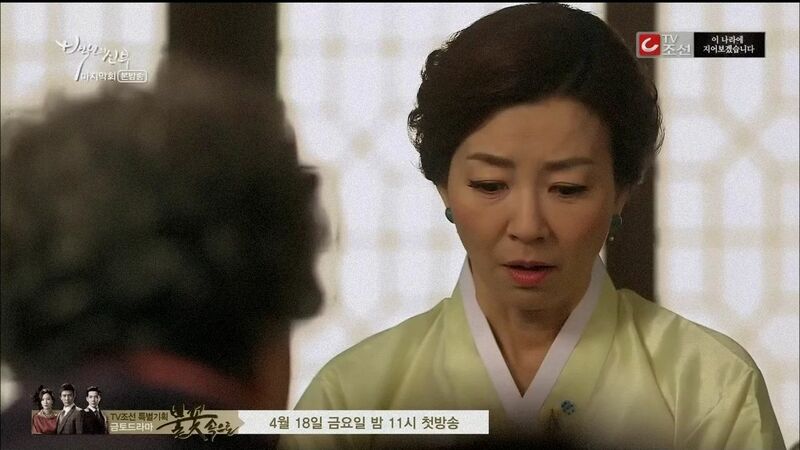 (1) Grandma being the runaway bride of Kang Joo’s grandfather – the timing is incorrect. It had to be more than 50 years before unless we are to believe that Kang Joo’s parents are in their late 40s? And that Grandpa got married straight away and had the next generation i.e Kang Joo’s dad. (2) Star’s story about how Yi Kyung and Doo Rim came to look alike made no sense. What was the purpose? If she was looking for revenge she could have taken it against President Ma straight away in the scene where Yi Kyung was a baby – save she thought it fun to make Yi Kyung look like Doo Rim instead?! Episode 14/15 made it seemed as if Star was waiting for President Ma to appear in this lifetime to take revenge – i.e on the presumption that she couldn’t find her in the first place. How then could she have sealed the fate of the 2 babies to look like each other as a tool for love or revenge?! Absolute nonsense here. (3) Was there a reason even, that Doo Rim was chosen? (4) So Grams was the runaway bride because she eventually eloped with her lover…. if so why did she even bother to save a shoe from her wedding to Grandpa Choi? Won’t one just throw everything from that unfortunate episode & not to be reminded? Nonsense again. (5) The Choi family is supposed to be a rich and powerful chaebol. Did Kang Joo really have to drive all around South Korea to look for Doo Rim if he really wanted to look for her for 2 whole years?! (6) Your wife runs away. You only manage to find her after 2 years. She brings you home and says this is your son…..and you have no reaction? Yeah right. (7) What’s up with the spa scene with Yi Hyun? Doo Rim is back with Kang Joo and she can’t afford a little pampering? Thought it would have been more appropriate if Yi Hyun oppa treated her and Kang Joo to a meal or something. No hard feelings and acceptance as a family. Albeit all the nonsensical parts, I really enjoyed watching Bride of the Century. It’d be hard to find another show that makes you want the week to go faster so you’d find out what’d happen next. Here’s happily ever after to Kang Joo and Doo Rim! @NGsans. well said you, good reply. I think we all got a little bit involved in this Drama but yes you are spot on, it is a drama after all but nice to have one with all the elements to keep we the viewers so interested. It is rare to have a combination of good writing a great cast and director to pull it off so well. This one deserves an award for 2014 I hope they get it. 4. Becos DR grandmother felt very guilty about it. Imagine that she took Choi’s family money and planned to run away from the start. We all know grandmother is a good hearted person, so it’s only natural that she cannot get over her sense of guilt despite that it has been so long. 5. think miss koala’s review did mention about it. 7. That one is one true product placement. You know add commercial into the hottest drama around. Hahahahaha. It doesn’t make sense but it gives the drama money for production. LOL. I guess I have to agree on some of your comments. But we can’t have all the perfect plots in a drama. Of course, some things are not logic and very hard to understand, well I stop to analyse it but watched more to enjoy it. Thanks Ms. Koala for the wonderful recap. You kept me want to read more eventhough have gone through the whole episodes of BOTC. I really love this drama, love the character of both otp. And I kind of understand their love because it is supposed to be patience, understanding and giving you hope. Thanks again. 7) The spa scene is Yi Hyun and Yi Kyung – not Doo Rim. The only complaint I have with Jin Sung’s acting is that at the end when Yi Kyung became good, I had a slightly hard time telling the difference between Yi Kyung and Doo Rim. Thank you for the recap.. I was searching & waiting. Your wonderful recap put me at easy for a beautiful happy Sunday night. TQ! Looking forward for the English subtitled version over the next few days. Still have to watch and enjoy every bit though; after your fabulous recap!! Your recap was wonderful and I really enjoyed this drama as well! I highly recommend the new drama Hotel King and I would love for you to do a recap of the episodes! Thanks! thank you, thank you for all recaps. you are so awesome. really loved this drama. 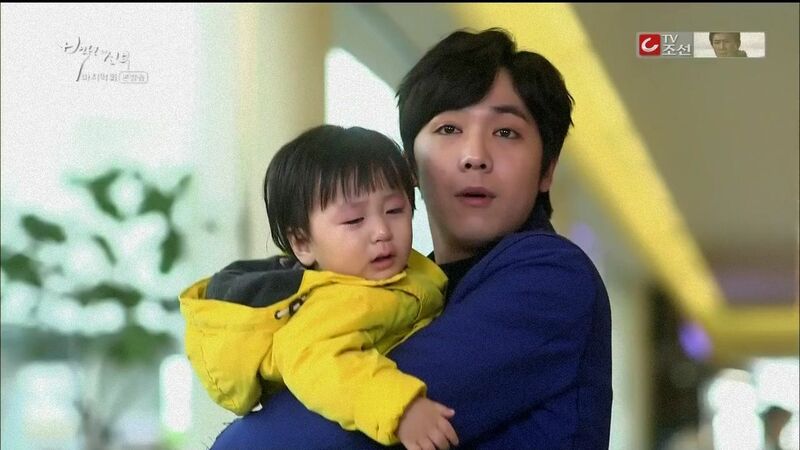 never thought hongki was a such a great actor.especially since he is such a wild child. 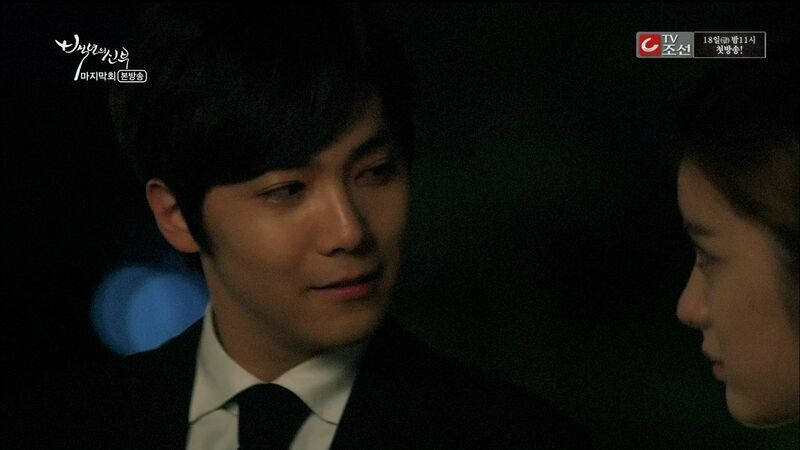 his character totally opposite from colorful lee hongki. Thanks so much Ms. Koala for the recap…I skimmed through it lightly so as not to completely spoil it for myself because I have not watched the last two episodes yet. I read some stuff online about how people were disappointed and I was kinda worried. Phew! Now am off to watch. I have loved this series and loved reading your recaps of it. I also had very low expectations of it at the beginning and was not a fan of Hong Ki at first, plus I only knew of Jin Sung from Secret last year (where she was good even though she was barely there) and now I look forward to more of their stuff (have also fallen in love with FTIsland and Hong Ki’s voice as a bonus, so thanks drama for expanding my horizon). See you all next time! Thank you so much, Ms Ockoala for recommending this drama. I’ve enjoyed watching it and the last episode was just beautiful. Lovely ending! Wow! What a drama! Lots of unexpected stuff but is it me…am not sure of something…if the murdered woman/ghost originally “coveted” someone else’s in the past life, and Buddhism is against covetousness…why is President Ma punished (in mental institution) but ghost gets her man in the afterlife? Just wondering about the whole adultery coveting another person’s husband thing. The only thing I could think of, because it felt so BBJX, was that at that time, the man was allowed to have more than one wife(ish) person. Poor man’s concubine? Ahh, thank you Koala for bringing us these recaps every week-end. I read Saturday right way, but wanted to delay this one. I think I may want to rewatch the last few again when I get a chance, and when I am not rushing to find out what happens, because I still don’t get all the connections. KJ Oma saying “Don’t cry when I take your money.” in Go Stop. Thanks, again! I hope we do get another surprise like this soon in Dramaland. Thank you so much for covering this drama in the first place, else it would have completely slipped off my radar. I fell in love with ftisland and hongki’s voice because of it and even managed to catch them live in concert in time so I’m eternally grateful! It has its flaws but it’s such a lovely and cute drama which I will treasure very much! Thanks again for the wonderful recaps! I loved the last part when they’ve shown the people behind the scenes. I love it when dramas do that. What I liked the most about the show is the exemplary execution of the familiar k-drama tropes. It really comes down to the how tightly the material it is written and how well it is executed by the casting and the crew. This kind of scenario couldn’t have been pulled off so well otherwise. The writer and the director stayed true to the spirit of the show from beginning till end -nowadays this is so rare because of the live-shooting and the pressure of ratings. Overall, what a pleasant ride. 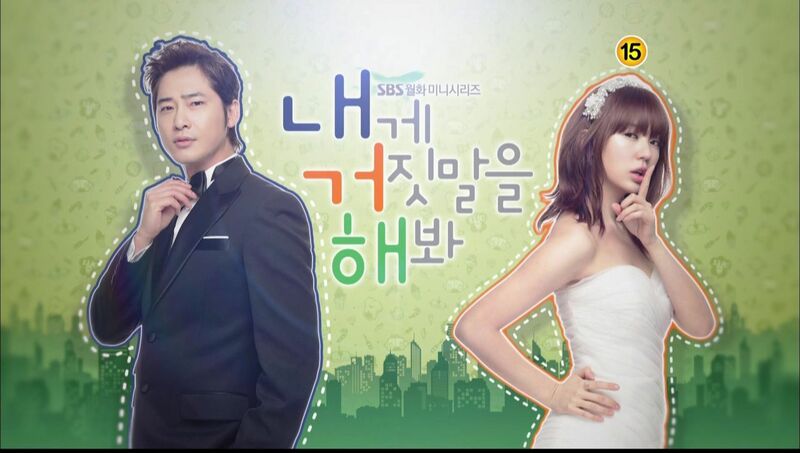 I’m off to watching Secret Love Affair now, my new drama crack! So glad you’re covering it also. I’m crying tears of happiness!!! So good! This drama had the most resolved endings I’ve ever seen! Thanks to koala for recapping and to everyone for coming here week after glorious week to fangirl with me. So sad it is over! 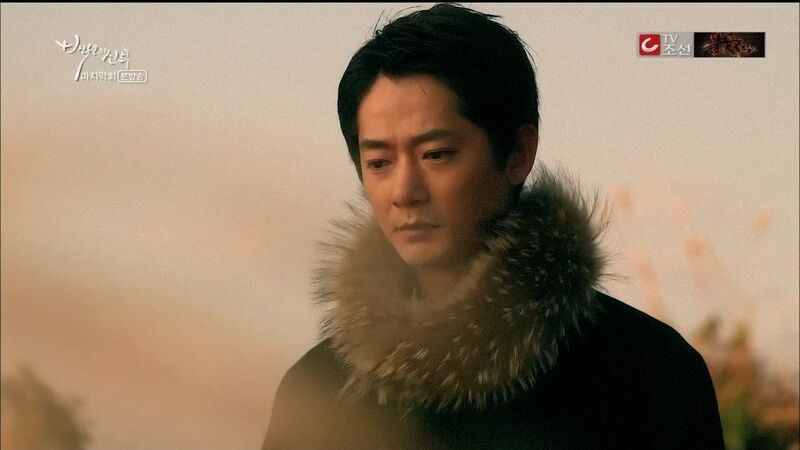 the acting skills were so wonderful that I would almost understand the drama completely. Actually played FOUR (4) roles if you include the 100 and 50 year old stories. Thank you Dramabean. Imho, episodes 1 to 14 took us on a wild ride, 15 and 16 were anticlimactic. Too many inconsistencies and 16 lacks the lightheartedness and touchy feelings of previous episodes. Every thing was wrapped in a bow, a little too pat. Would have done better with an extension to flesh things out better. Still, a solid show with unique elements. great ending to a drama that have two lead that look great together. I’m wondering about the relationships in the show. So, Byul is actually Choi Kang Joo’s grandmother? She gave birth to Choi Kang Joo’s dad who was the little baby boy that was saved by Boon Ee (Doo Rim’s previous life’s character)? Am I right to say this? 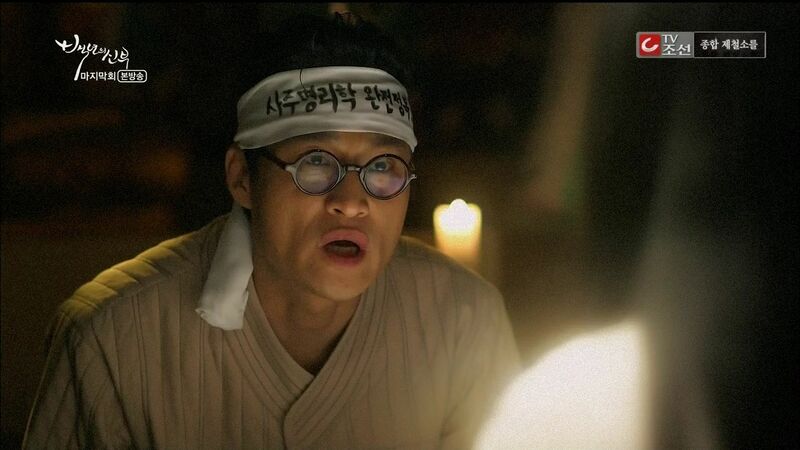 In the earlier episode, Kang Joo said “You’re Here” to the ghost, Byul. And, Byul was there for him all the years. Was Byul taking care of her grandson (i.e. Kang Joo)?? many thanks! i’ve got a bit of a headache trying to figure out who is related to who! Yes you are right. Doo Rim current grandmother is the run away bride who purposely leave behind one shoe to let people thought that she fell down to the cliff. The lady ghost take care of the owner or the first born son of the generation. Byul was KJ’s Great-great grandmother, who gave birth to great grandfather who was raised by Great-great grandfathers wife(who could not produce an heir). If it had not been for Byul getting pregnant, the Choi family line would have ended. That is why DR was grateful to her since it led to the line continuing, and her meeting KJ and therefore having Kang Rim. Byul was always protecting the family line that was her offspring, they are all her grandchildren through the generations. Thanks for all the awesome recaps!!!!! What a great story that wrapped up well. Honestly, I absolutely hate the last minute OTP-separation trope because most of the time I feel like it’s unnecessary. I wasn’t all that happy when it happened here, but I like your explanation for it, and it makes me feel better about it. I just wish the separation wasn’t so long…I mean…two years…really? That’s a LONG time. I watched drama after reading your recap. I would have bypassed it because it didn’t seem interesting. I finished this drama in two days. Continue to recap hidden gems. Despite me watching and recapping all the episodes in my head, I still can’t figure out when they pounded rice to make Kang-Rim.Am I just that much of a fail? Haha I agree. It was the question constantly bugging me as I watched the final episode. I think I would have to say “magic” in this case. Did anyone else wonder how Doo Rim got pregnant with Kang Rim? Nope, just me? They were together on their wedding night in the cabin. First of all thanks for all the recaps..great effort on your part. Thanks a bunch. I just finished watching BoTC, and the reason I’m commenting is because, I really can’t accept Doo-Rim’s actions regarding a few very important milestones in one’s life. I let it go the first time, when she conveniently hid her real identity ,to marry the man she so dearly loves but still leaves him at any given point depending on the circumstances which makes me think, If she really can be strong enough to leave him like that ofcourse enduring the pain alongside, then why couldn’t she tell him about her real identity. Because, marriage is the most important part of everyone’s life and how can you start your new life with the roots of that relationship being flawed/untrue. This really is something I just can’t let go.. This is something very terrible on so many levels.. While I really appreciate the female lead’s acting prowess. I really didn’t like Doo-Rim as a character, I don’t hate her but I don’t like her either. I felt bad for Kang ju because of this. That is something every man deserves to know asap.. But then it is a fictional show so ofcourse it doesn’t matter but then again dramas do influence a lot of people in real life. Okay I didn’t see your comment before I posted. I totally agree with you about how selfish she was to have not let kang joo know he has a son!!! Bravo! The drama was entertaining. Both the characters and producers really try. Appreciate at least and give them hope they are all doing it for u guyz. No body is perfect and we all have flaws.